Path dependent RFI tools include ferrite chokes, power line filters and noise cancellers. Using these can make all the difference between listening to signals and listening to interference. If your RFI is purely radiated and traveling a decent distance, your best bet may be phasing noise canceller. Spatial filtering with two antennas gives you a chance to null radiated RFI before it enters your receiver. These work best when RFI is approximated as a single point source some distance from your antenna. Devices such as the ANC4 or MFJ1026 are far less effective when faced with multiple sources, or swamped with isotropic RFI within your home. These are truly path dependent RFI tools, and do nothing for conducted RFI. Ferrite cores work well for common-mode conducted RFI on medium and shortwave frequencies. Basically, several turns through a well chosen ferrite mix can add at least 500-1000 Ω of impedance to knock down RFI traveling along the outside of a shielded or other cable. Just make sure to get cores made from mix 31 or 43. You can find a ton of useful information at various vendors, such as Palomar Engineering, as well as expert advice from Jim Brown K9YC on the use of ferrite cores. Spend the money on a large collection of ferrite material. They come as toroid cores, clamps and snap-on format. Make sure you have some larger ones so that you can get multiple cable turns wound through the cores. My guess is that the average ham or SWL should have dozens of these wonders in permanent positions. Often, you may need multiple ferrite cores on a single cable. Impedance is like resistance: it adds in series. According to Jim Brown, you get an additional 6 dB of noise suppression for each doubling of series impedance. Choke impedance reduces RFI current quite a bit. This can make all the difference. Anyone who says otherwise is either using the wrong mix, or has selected incorrectly from wrong path dependent RFI tools. Common-mode chokes do not reduce differential mode noise. For these type of conducted noise, you need a low-pass filter inline, together with a ferrite bead on one of the differential line pair. Having said this, ferrite chokes do work to reduce CM noise coupled to Ethernet cables. So, how about SMPS? Nearly all SMPS RFI is conducted in the first instance, and radiated later. Some people simply remove all SMPS cubes from the shack and replace then with a single linear regulated power supply. You will find the approach quite simple if all your devices use 12VDC. Just build or buy a DC power distribution box and connect it too a linear supply. 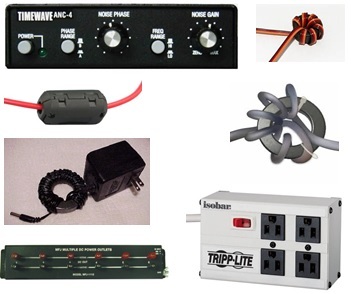 Then, make cables with appropriate coaxial power plugs for your equipment. Some folks go as far as buying proper AC EMI line filters. These are quite expensive but also effective. Stay away from consumer power bars that claim to contain EMI filters. If you can’t check out the specs online, filtering is probably not that effective. Lastly, you can build your own power line filters quite cheaply, embedding professional filters. You can buy brand name line filters on e-bay for reasonable prices, e.g. $5-$20 dollars. Just search for “power EMI filter.” Here are examples of home made EMI filters from VK3KID and K9YC. If you try this, safety first: do it right!